You are here: Home / Filipino Martial Arts / Arnis, Eskrima And Kali – What Really Is The Difference Between The Three? The words Arnis, Kali, and Eskrima have been quite confusing to many people who want to understand what the differences between these martial arts are. The different forms and styles of Kali Arnis Eskrima. We will address the issue in this post and provide you with a definite answer on the difference between Arnis, Eskrima and Kali. The FMA or Filipino Martial Arts, like many other martial arts, is a system with numerous branches. Depending on the major island e.g., Luzon, Visayas and Mindanao, where the art is practiced, the instructor or master or instructor may call it Arnis, Eskrima or Kali. These martial arts are, in fact, part of the FMA. Eskrima is derived from the Spanish term “Esgrima,” meaning fencing. The art’s influence was derived more from the Visayas Region of the Philippines. Arnis, also a Spanish term came from the term “Arnes de mano,” meaning “armour of the hands,” referring to the ability to protect with the weapon. Double Stick Drill with a partner in Kali Arnis Eskrima. Later, the term was shortened to what we now know as Arnis. In the northern region of the Philippines; Luzon, Arnis was the most common word used. Arnis Eskrima Kali drill using the single stick. Kali, however, is a Filipino term commonly used in the southern region of the Philippines; Mindanao, as well as a common term used by many FMA practitioners. Double stick sinawali drill in Kali. On the whole, these martial are all the same. The practitioners of these martial arts influenced each other, and therefore, they have numerous similarities. Often, the difference only depends on who teaches them. A few of the differences between them are the execution of methods, stance differences, speed and power techniques, heavy versus light sticks, short sticks versus long sticks. There are numerous similarities than differences. These three also all instruct edged weapons defence, stick fighting and double stick fighting, empty hand self-defence and dagger techniques. Every martial art has its own patterns, and each one emphasises self-defence techniques. Regardless of the name you use to describe FMA, one thing is for certain, it is a beautiful art to watch, exciting to learn, and its applications for self-defence are practical and among the best in the world of martial arts. Filipino Martial Arts are, in fact, an umbrella term to refer to the many different weapons-based, martial arts systems from the Philippines. As we have learned earlier, Kali, Arnis, and escrima are just various terms to refer to the same system. Quite frequently, empty hand concepts and drills are based on weapon movements. Numerous Filipino Martial Arts teachers and masters are fervent in their belief that they are very practical systems for self-defense. Almost all Filipino stick fighting drills focus on weapons training on the first day of class. The majority of weapons training transfer well to daily objects like pens, tote umbrellas, rolled up magazines and newspapers and is limited by your imagination. First, a few systems are primarily based on stick work. 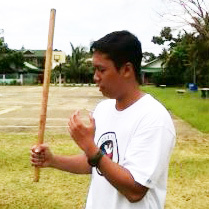 Doce Pares, Balintawak, Kombatan, and Modern Arnis are stick-based. Other systems emphasize more on swords. As a sword system example, below is Master Tony Diego from Kalis Illustrisimo training a fellow practitioner at a park. Blade-based systems, like the Sayoc Kali Fight, are effective as well. Despite whether they teach knife, sword, or stick, a lot of instructors teach many empty hand styles and methods based on weapon movements. Therefore, one of the primary advantages of Filipino stick fighting training is training in both empty hands and weapons concurrently. Want to move like Bruce Lee or Jason Bourne? They all underwent kali stick drills training in Filipino Martial Arts. They truly did! Bruce Lee was a long time student and influenced by the remarkable FMA proponent Dan Inosanto. Here’s a video from the film “Enter the Dragon” portraying Bruce Lee using eskrima sticks. Matt Damon also trained extensively in FMA at the Inosanto Academy of Martial Arts for all his Bourne movies. Sports sparring has turned out quite popular causing worldwide competitions like World Eskrima Kali Arnis Federation (WEKAF) Championships. The concept of testing and assessing your skills with the defense is immensely appealing for loads of Eskrimadors. Movies like “The Hunted,” “The Book of Eli,” “Quantum of Solace,” and several others have exposed lots to this exciting martial art. Hollywood has obviously attuned to the excitement and thrill of combat scenes involving Filipino Martial Arts choreography. Most remarkable are the combat scenes seen in the “Bourne” films. The Haunted movie – Kali knife fighting scene. Bottom line, Filipino Martial Arts, because empty hand and weapons techniques are taught alongside, is very functional for defending oneself and is a lot of fun!